Hey guys! We have had a busy week around here. My son is on the high school swim team and we are right in the middle of the swim season. 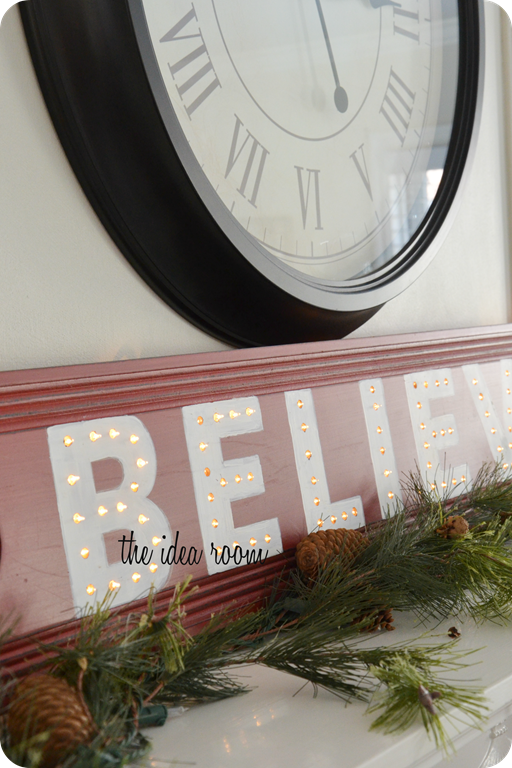 So my mom duties have pushed aside this blog thingy ;)…as it should! 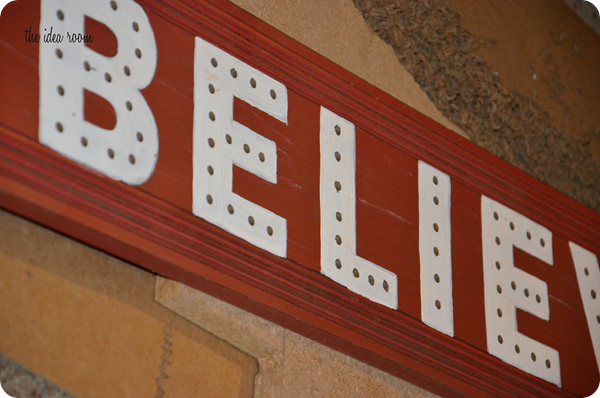 But I found some time to finally share with you this BELIEVE sign. 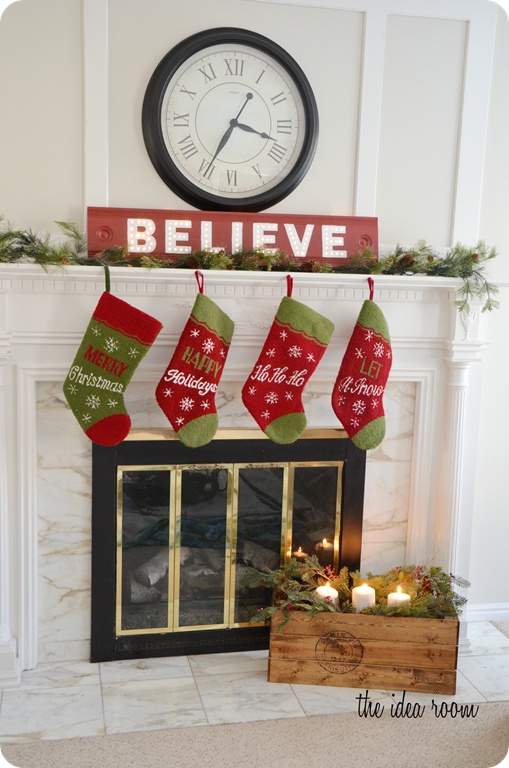 It, along with this Vintage Crate, are my favorite DIY Christmas decorations that I have made so far. I actually bought this board over two years ago with the idea of this project in mind but I never actually found the time to get around to making it. So it sat in my attic waiting patiently for me ;). 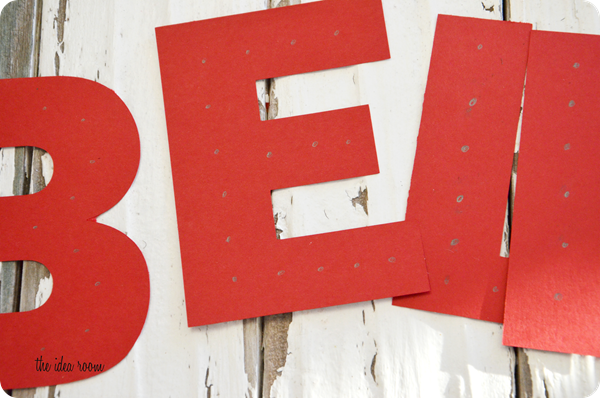 I picked the board up from my local Bennion Crafts and it was already this fabulous red color with the fun edging. 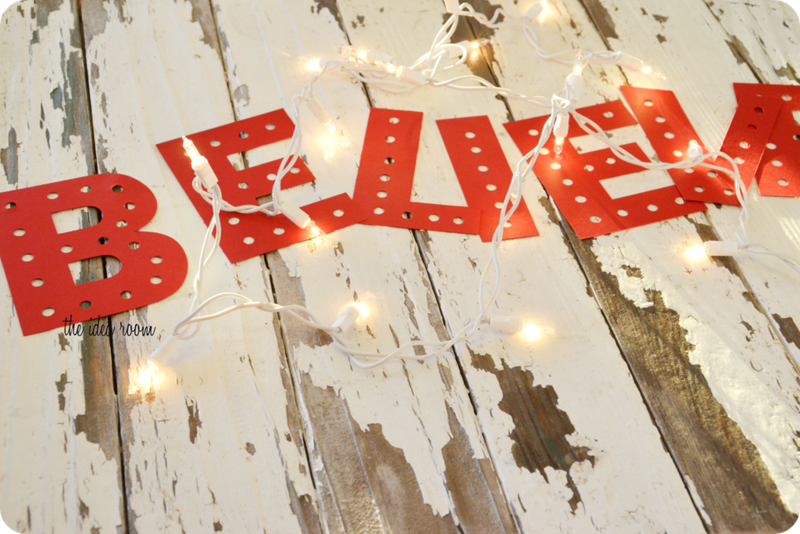 I cut out the word BELIEVE on my Silhouette CAMEO and then drew little circles where I wanted the Christmas lights to go. Make sure they are evenly spaced to get the best overall look. Take a hole punch and punch out the dots where the lights will be. *IMPORTANT–Be sure to count the number of lights you have on your string of Christmas lights. You want to be sure you have enough lights for each hole. AND…make sure that the lights will fit from one hole to the next. There were a couple of spots that I had to skip a light so the wire was long enough to reach the next hole. Does that make sense? Check and double check. And for best results it would be nice to make sure you have a few leftover lights and the end…just in case. You can always hide those lights behind your finished sign. I traced the letters onto the wood and then painted the letters white. I chose not to spray paint my sign since it was snowing the day I made it ;). Then after the sign has dried, you can put your punched letter “stencil” on the board and use a pencil to mark where the holes should be drilled. Take a drill bit that is the same size of your Christmas lights and drill holes where each light will be. Then comes the fun part…Place the lights so that the plug is on the end where you need it to be as far as where you will be plugging it in. Then insert the lights into each hole. 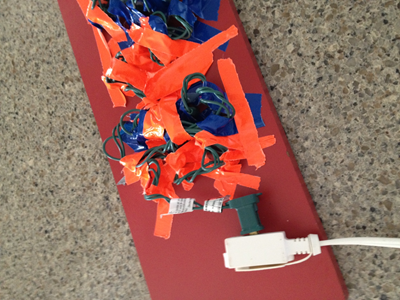 You will want to use some duct tape to securely hold the light in place so that they don’t fall out of the hole. My kids LOVED helping with this part. You can see what a great job they did on the back of the sign! But no worries, no one will be the wiser once the sign is turned around. I LOVE how it turned out! And I love it even more at night! Don’t you just love this time of year? 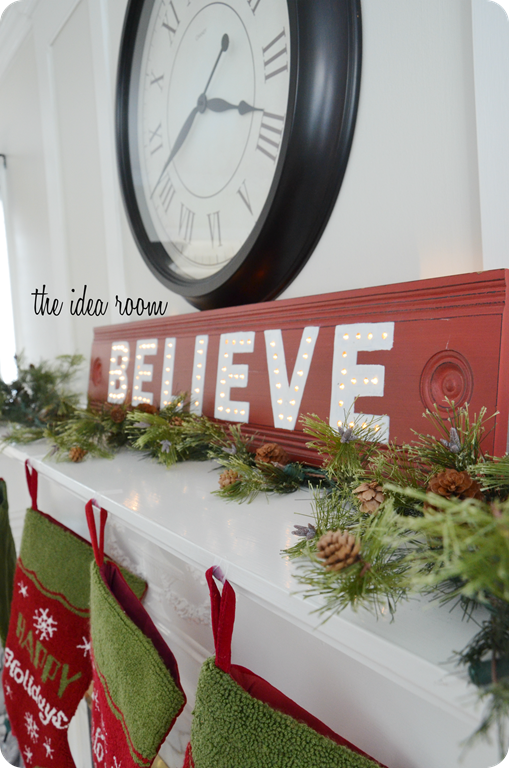 I love Christmas lights and I love how cozy they make your home feel. This is gorgeous!!! such a brilliant idea!!! LOVE this! The lights add the perfect touch! Great job Amy! Great sign Amy- love it! Happy Holidays! Thanks Denise…for the sweet comment and taking the time to leave one! I love this! I have been wanting to make a painted sign for Christmas decorating. The addition of the lights is so clever! Thank you so much! Christmas lights make me happy so I like to use them a lot! I bet this is wonderful at night. I love that you added lights. I have a string up in my craft room that I plan on leaving all year round- they just make me happy. Wow, that’s awesome! What a fantastic sign! I don’t know if I am ambitious enough to attempt it b/c I tend to be somewhat clumsy. But I can definitely admire your work at least! You are so sweet. Thank you so much! This is just amazing! I think I’m going to buy some battery operated lights so I can try getting this done for next year! Great job!!! Thanks Nicole! Battery powered lights are a great idea! Such a neat idea! 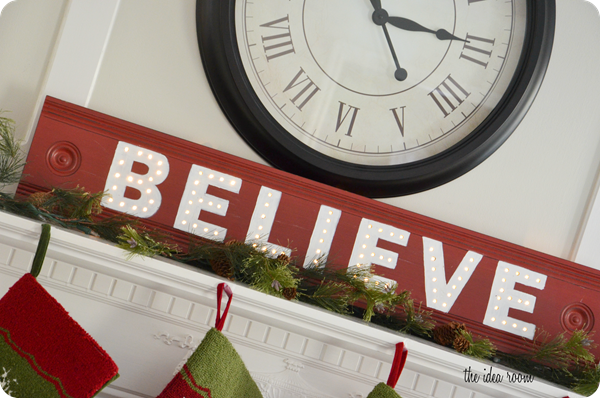 I hope you don’t mind but I have shared this link/post on my biz face book fan page, Happy Holidays! Thanks for the awesome idea! My boyfriend and I tmade it, and it turned out great!! Oh yay! I am so happy to hear that! I sure do love mine! !